Spring has arrived at FREE with many exciting announcements. We welcomed TRI Business & Career Center to our Old Bethpage headquarters and opened our new Center for Talent Development in Oakdale. 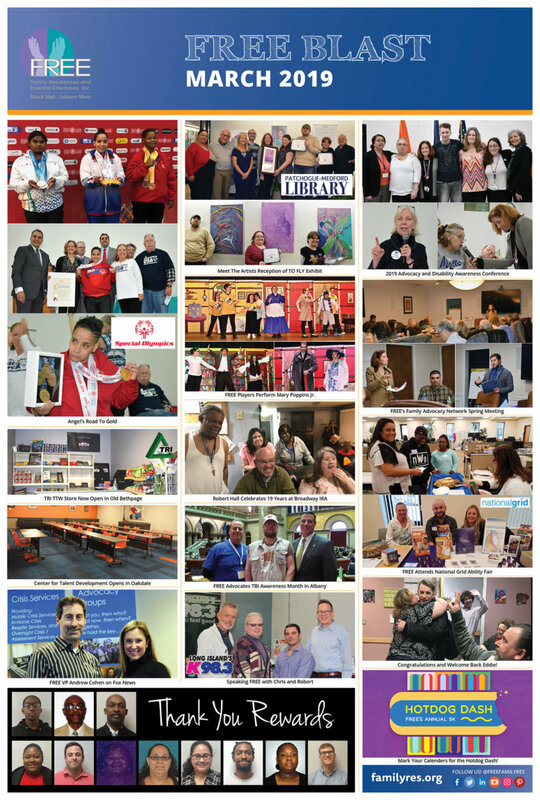 To celebrate Developmental Disabilities Awareness Month and Traumatic Brain Injury Awareness in March, we hosted a successful Advocacy Conference for the people we support and traveled to Albany to educate legislators about Brain Injury Awareness Month. One of our individuals made history by winning four-gold medals in powerlifting at the World Special Olympics Games in Abu Dhabi. Our Fine Art and Art Therapy Programs continue to inspire everyone with their newest art collection, TO FLY that was previewed at the Patchogue-Medford Library. I hope you all enjoy the spring weather and are excited for the upcoming Hotdog Dash in July! The story this month with the loudest roar was the remarkable success of Angel Athenas, the award-winning Powerlifter who lives at our Penelope IRA. Upon meeting the requirements to compete at the Special Olympics World Games in Abu Dhabi, several major media outlets including News 12 Long Island, ESPN and Newsday covered the story of her road to gold. Before her trip, her friends and supporters at FREE gave her a huge send-off rally. At the games, Angel competed in four events – Bench Press, Squat, Deadlift, and Combined Squat, Bench Press and Deadlift – and won gold medals in each of them! An even bigger celebration at FREE was given when she got home to congratulate her on her victory. The event was attended by many County and Town Executives and covered by major news programs. Congratulations Angel! To say we are proud would be an understatement. We were pleased to see many new faces when TRI Business & Career Center moved their services to the Old Bethpage office. One of the perks of this TTW program is the opening of the TRI TTW store, giving individuals hands-on retail experience as well as a place for FREE Employees to shop for snacks and gifts. The store is open Monday thru Friday from 11:30 am to 12:05 pm, as well as Tuesday, Wednesday and Thursday 9:45 to 10:15 am. 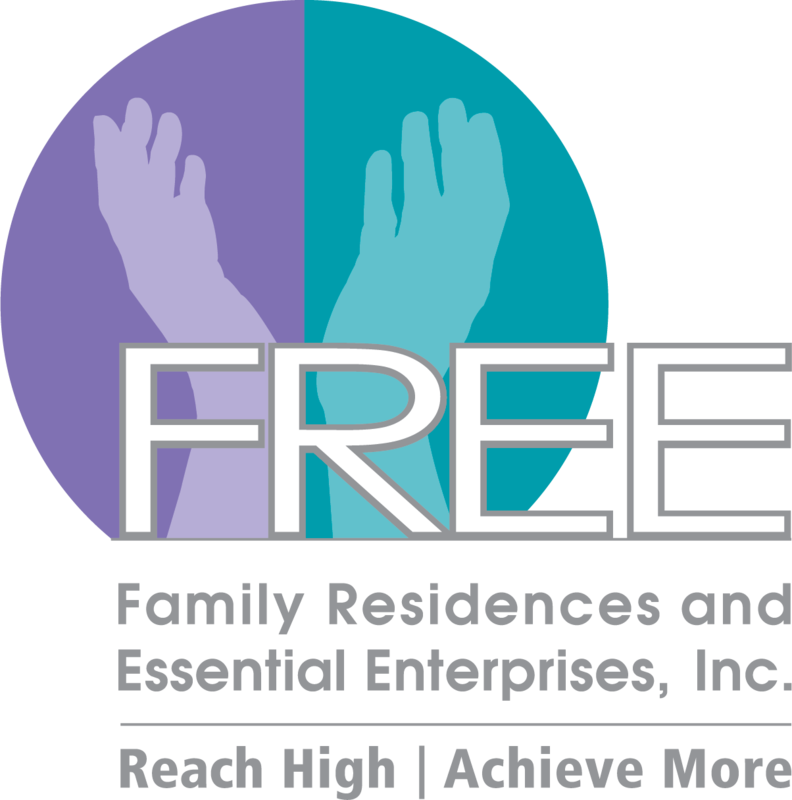 FREE’S Center for Learning and Professional Development and our HR Recruiting team have settled in at FREE’s new Center for Talent Development in Oakdale. This move shifts our hiring and training functions further east, where more team members and candidates can get to us. The brand-new center offers two large training rooms, space to welcome and onboard candidates, and plenty of parking. Team Member Orientation and most of the other regular training sessions will be held here. We look forward to their Official Ribbon Cutting in April. The value of Disabled Persons in the workplace was given nationwide attention this month when Walmart changed the mandatory physical requirements for their Greeter position, a job held by many I/DD individuals. FOX 5 News interviewed Andrew Cohen, FREE Vice President of Employment Services, for a report on the situation for which he affirmed the loyalty of these workers and why it would be unfair to eliminate this position. The backlash within the press and social media caused Walmart to re-think their plan and they are pledging to make “every effort” to find other roles for disabled workers within their stores. Proof that advocacy does work! FREE held a Meet The Artists Reception at the Patchogue-Medford Library to recognize the artists who have their art on display at the Library. It was great to see Paul Pontieri Jr., Mayor, Village of Patchogue, along with FOX 5 TV and FIOS1 TV attend to support and cover the event. It’s not too late to see FREE’s latest collection of Fine Art, TO FLY, as it will be showcased there through April 30. (Our exhibition is on the lower level, next to the children’s area.) The collection moves over to the LENZ Winery in May through Labor Day. Mary Poppins Jr. Is A Smash! The FREE Players presented two standing-ovation-worthy performances of Mary Poppins Jr. on March 30th. Months of hard work rehearsing paid off as they danced and sang much to the enjoyment of all those who attended. We all extend our congratulations and gratitude to DSP Robert Wall who just celebrated his 19th anniversary at Broadway IRA. The individuals planned a big surprise celebration! Robert is a hardworking, caring man that absolutely loves the people he works with and we are proud to have you on our team. FREE TBI ILST and PBIS provider Ira Dunne and TBI survivor Colan Trowbridge traveled to Albany to advocate for Brain Injury Awareness month. The pair were invited up to the NYS Assembly floor by Assemblyman Anthony Palumbo. The March 17th episode of the monthly radio program “Speaking FREE with Chris and Robert” focused on Direct Support Professionals Workforce Crisis and featured the following guests: John Drexelius, Jr from Law Office of John Drexelius and bFair2DirectCare Consultant; Fred Catapano, Manager of Recruitment, FREE; John Best, Senior Vice President, Human Resources, FREE. The monthly show, which recently celebrated its one-year anniversary is hosted by Robert S. Budd, CEO, FREE and Christopher D. Long, Ed.D, President. Andrea Vance and Edward Wiedemann. These Valued Team Members have exhibited behavior that inspires all of us to go the extra mile. If you would like to nominate someone for a Thank You Reward, please contact Pat Hogan at PHogan@FamilyRes.org. Winners of a Thank You Reward receive a gift card and thank you card to show our appreciation. Our annual forum on advocacy was a huge success with over 150 attendees. Some speakers shared their personal stories, while others within the FREE network provided valuable information on support programs, Legislative issues, and voting. The FREE Vocational Services team offered CQL Training of the 10 Basic Assurances to make all are aware of their human and civil rights in their everyday lives. The 2019 Advocacy Awards were given to Eddie Lattenhauer (an individual who has thrived from working with our TBI Day Program) and to Annie Zoitke, whose dedication to supporting individuals and their family members goes beyond all expectations. The afternoon was topped off with an inspiring performance from the FREE Ensemble. FREE’s Family Advocacy Network held their first meeting of the year this month. The topic discussed was the role of a ‘Direct Support Professional’ and how their care needs to be addressed in order for them to care for others. FREE was one of thirty agencies that participated in National Grid’s first Ability Fair. The goal of the event was for National Grid to educate their employees about the services available on Long Island for individuals of all abilities. In addition to FREE’s information table, attendees were entertained by the FREE Players Ensemble and enjoyed Terry’s Cafe’s famous cookies. Congratulations and Welcome Back Eddie! Mark Your Calendars For the Hotdog Dash! FREE is excited to host our first annual 5K, the Hotdog Dash! It will take place Sunday, July 7th at Old Bethpage Village Restoration. We invite people of all ages and abilities to join together to walk, run, roll or stroll through this historic Long Island landmark. Following the race and award ceremony will be a barbeque, including food, beverages, local business displays, games, and raffles! Check the FREE website for more details and registration info.